Powerered by a torquey, fuel-injected, 449 cc engine, the 2019 RMX450Z is the motorcycle that’s ideal for serious off-road work or just a fun day on the trails. Everything you need to take the lead off road is here, starting with the slim, aggressively-styled chassis and bodywork. 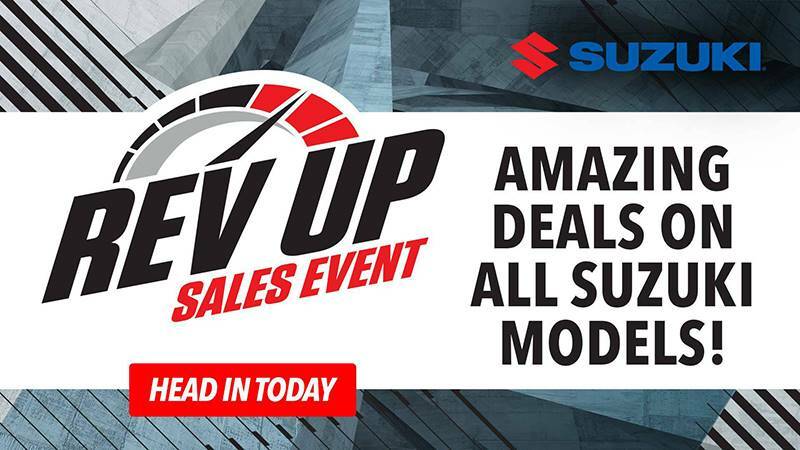 Toss in the push-button electric starter, the full-function, two-mode instrument cluster, and enduro lighting, and you have the conveniences that take the worry out of your ride. 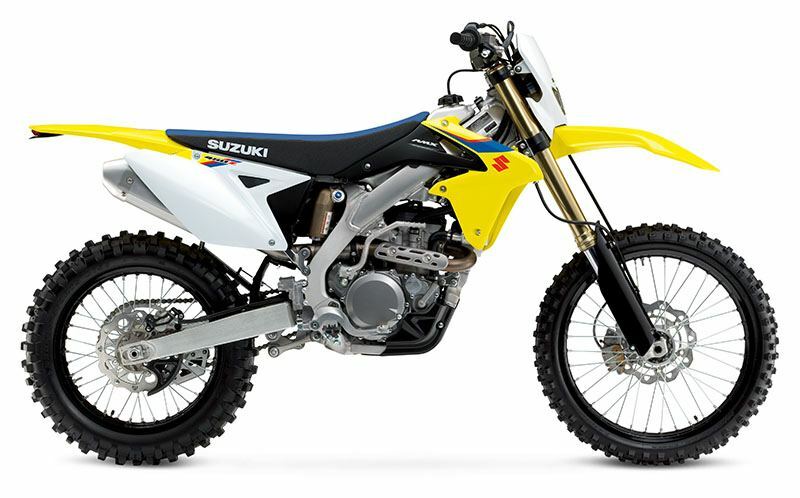 Sharing core engine and chassis technology--plus new bodywork colors and graphics--with Suzuki’s Championship-winning open-class motocrosser, the RMX450Z rewrites the rules for serious trail riders. The aluminum alloy twin-spar frame combines cast and extruded sections to achieve low weight with high rigidity and durability. RM-Z450-derived trail-ready suspension uses high-performance Showa forks with full adjustability. Aluminum link-style swingarm is descended from the RM-Z line and uses a fully adjustable Showa piggyback reservoir style rear shock. Rear suspension linkage geometry combines the RM-Z series' renowned turning-on-rails abilities with optimized handling performance for trail rides. Race-inspired waved disc rotors are mounted to black Excel aluminum rims with stainless steel spokes. High-impact, black plastic fork leg and rear brake rotor and caliper protectors shield these components from trail obstacles. The standard Renthal Fatbar is stronger and reduces vibration better than conventional aluminum handlebars. Bright 35 W headlight is smoothly incorporated into the front number plate. Trim, low-draw LED tail light is neatly tucked under the lip of the rear fender. The full-function, dual (sport / standard) mode instrument cluster is in a durable, ultra-compact housing. Sport mode simply shows timer, tripmeter, average speed, and tire-diameter correction (to reduce information during spirited riding or competition).Standard mode also shows speed, time, two trip lengths, and voltage. The instrument’s integrated tire diameter calculator allows precise fine-tuning for different tires to ensure accuracy of the speed and distance displays. Instruments include a low fuel level warning light. Champion Yellow bodywork (including yellow fenders and white front number plate) comes with race team-inspired graphics package. Gripper seat, with projected cross-shaped patterns on its blue top surface, aids rider control. The RMX450Z’s 449cc, four-stroke, four-valve, liquid-cooled, fuel-injected, DOHC power plant is based on the high-performance and reliable RM-Z450. 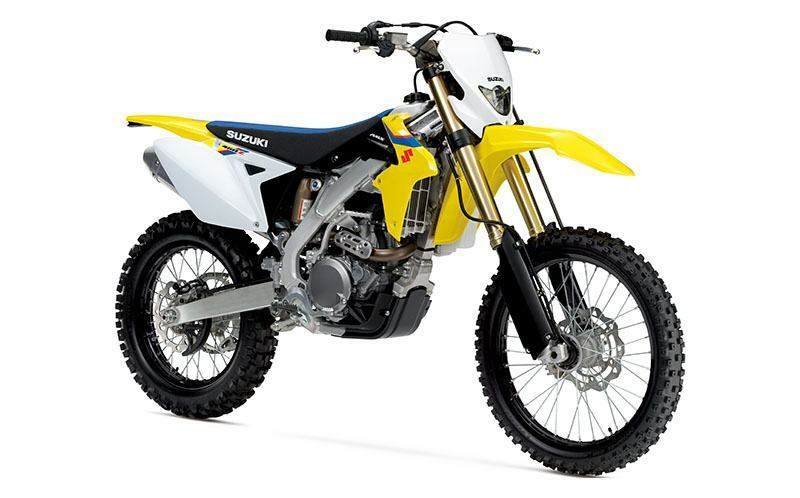 Minimal differences as compared to the RM-Z450 motocross engine include a modified inlet tract and revised cam profiles to increase low- and mid-rpm power. A larger magneto generator is fitted to charge the battery and power the lights. The increased mass on the crankshaft also aids traction. Advanced fuel injection system makes for extra-smooth power delivery, high fuel efficiency, and superb reliability. The airbox features a hinged lid for quick air filter maintenance and better protection from debris. The coolant reservoir tank has a specially located filler cap for easy access. Fuel-injected engine is based on Suzuki's winning open-class motocrosser; the RM-Z450. The RMX450Z is EPA Emissions and California red sticker compliant. Trail-ready features include an electric starter powered by a compact battery (plus kick-start back-up), a coolant reservoir tank and an engine protector plate. Enduro ready, full-function instrument cluster includes a low fuel level warning light. The airbox features a hinged lid for quick air-filter maintenance. Aluminum alloy twin-spar frame features a high-performance Showa fork and piggyback reservoir style rear shock. Competition-developed seat and slim bodywork creates a controllable, ergonomic riding position. The racing-inspired bodywork and new graphics for 2019 include a sturdy steering stem that is anodized black, complementing the gold fork leg finish. Black anodized EXCEL aluminum rims are ready to withstand rugged off-road conditions. Strong five-speed transmission with wide gear ratios and primary / final drive ratios have been selected to suit various situations from steep trails to open terrain.